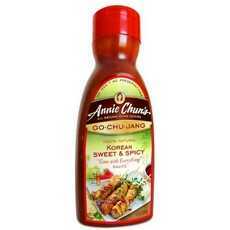 Enjoy Annie Chun's Go Chu Jang Korean Sweet And Spicy Sauce. Goes With Everything Sauce. Let This Korean Sweet & Spicy Sauce Bring Some Excitement To Your Kitchen. This Versitle Sauce Is Made With A Special Korean Miso To Give It A Unique And Complex Flavor, Then Chili Pepper Paste Is Added To Give It Just The Right Amount Of Spice. Liven Up Your Sauce Sales With The Introduction Of This Korean Culinary Secret! Say "Go-Chu-Jang"! (Note: Description is informational only. Please refer to ingredients label on product prior to use and address any health questions to your Health Professional prior to use.